Automotive Electronics Market size was valued at over USD 270 billion in 2017 and will grow at a CAGR of over 6.5% from 2018 to 2024. Growing sophistication of passenger & commercial vehicles due to the deployment of advanced and digitized technologies is a major trend that will impact the automotive electronics market. With the enhancement of vehicular systems that include powertrain, safety, comfort, and driving systems, advanced sensors, semiconductors, and related component technologies will be used. The global automobile industry is undergoing a transformation with developments in vehicle design to improve the customer experience. As a result, all automobile-related segments including electronic & mechanical systems are gaining high demand across the globe. Due to fuel consumption, energy, and pollution-related issues, an increase in Electric Vehicle (EV) production is observed in regions including North America and some European & Asian countries. In addition, governments are providing various incentives and tax advantages to OEMs and other industry players to support the EV industry development, further contributing to the market growth. 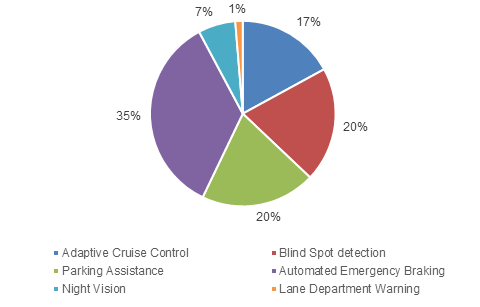 The increasing awareness about safety features in modern vehicles and OEM initiatives to provide enhanced safety & comfort to the consumers are driving the utilization of several electronic systems in the ADAS, safety, braking, steering systems, etc. These features offered by OEMs have substantially reduced the road accidents & fatalities across the world. These reasons along with the inclusion of extensive computing technologies and connected features are improving automobile capabilities. These developments have been possible owing to the substantial growth in the number of electronic components in the newly manufactured vehicles. The automotive electronics industry a has key focus on the product quality and compliance with the regional & global standards. Infotainment & communication application in the automotive electronics market is growing at a CAGR of above 6% owing to the increasing demand for in-vehicle infotainment systems in the new luxury and passenger vehicles. The growth is attributed to technical innovations & advancements in conventional entertainment systems that include connected technology and integration of internet services. These modern systems deploy several sensors and control units that support the smart and internet-based features such as mapping, handsfree calling, automatic locking, etc. These applications are gaining high deployment in passenger vehicles owing to the overall developments in vehicle designs and comfort & luxury features. In the automotive electronics market, powertrain applications are witnessing a rapid transition in the conventional systems due to the need for advanced energy-efficient systems. The growth of this segment is attributed to the presence of CO2 emission regulations for the automobile industry. These regulations and standards have resulted in consumer awareness about using vehicles and complying with them, producing lesser pollutants. As a result, OEMs are more focused on developing fuel-efficient vehicles that deploy advanced powertrains and engines. 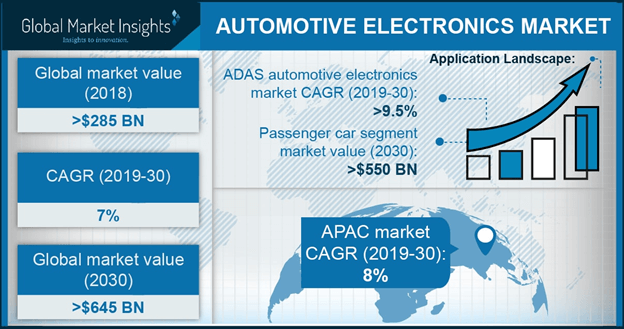 Demand for automotive electronics market in the passenger cars will grow to reach over USD 350 billion by 2024 due to the recent technical developments such as the integration of advanced safety systems at reasonable prices. The newly developed passenger vehicles deploy several new technologies such as driver assistance and infotainment & comfort systems that provide an enhanced traveling experience to the consumers. Due to the income growth, consumer spending capabilities have increased, resulting in the increased purchases of these vehicles. Moreover, OEMs such as Hyundai, Toyota, and Nissan are continuously transforming the passenger car designs and architectures to offer better car modules to the customers. All these factors coupled with stricter vehicle manufacturing legislation in Europe, Asia Pacific, etc., have created opportunities for industry growth. Commercial vehicles are gaining rapid popularity in the automotive electronics market due to innovative telematics systems. The newly developed commercial vehicles deploy several high-end and robust electronic systems that offer better performance and longer life in diverse applications. These vehicles are mainly deploying modern ADAS, powertrain, and infotainment systems that offer better facilities to the drivers as compared to conventional trucks and buses. The segment is witnessing a high demand due to increased business operations across various industry verticals. Moreover, the growth in export & import activities across the globe that requires efficient transportation & delivery network is further adding up to the production of commercial vehicles. Increasing manufacturing activities account for increased utilization of electronic systems, contributing to the market expansion. 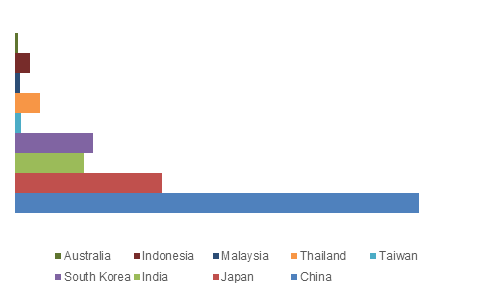 The Asia Pacific is expected to reach over 45% revenue share by 2024 in the automotive electronics market due to the developments in countries such as China & India. China is witnessing a significant increase in the demand for automobile electronic products due to the high production & consumption of electric vehicles. As a result, there is a huge requirement for enhanced powertrain and engine management systems that provide better fuel consumption capabilities. Additionally, the easy & cheap availability of raw materials and components due to the presence of several suppliers in China and other countries including Japan, South Korea, Taiwan, etc., drives the regional market growth. North America is witnessing a rapid growth in the industry due to the high consumption of passenger & electric vehicles in the U.S. Faster expansion of self-driving technologies and research activities that are undertaken to produce autonomous vehicles are creating several opportunities for industry growth. Additionally, government initiatives and permissions to carry out autonomous vehicle testing support the expansion of automobile technologies. The emergence of ride-hailing and car sharing services due to increasing integration of driver assistance and self-driving technologies in new vehicles is expanding the U.S. automotive electronics market. These technologies incorporate several sensors, ECUs, and other related components, further adding up to the demand for such products. 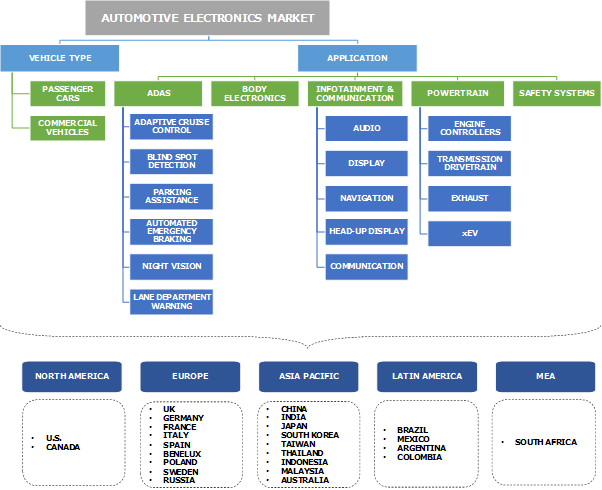 Prominent companies present in the automotive electronics market include Magna International, Continental AG, Bosch Group, Altera Corporation, Infineon Technologies, Lear Corporation, Delphi Automotive, Hitachi Automotive Systems, Texas Instruments, ZF Friedrichshafen AG, Voxx International Corporation, Faurecia, Hyundai Mobis, Valeo, etc. The key market players continuously undergo product development and innovation strategies to offer application-specific products and address the global industry demand. They adopt several acquisition & merger strategies to strengthen the portfolio and extend the company’s regional presence. In January 2018, Continental AG announced the acquisition of 5% stake in HERE, which resulted in the growth of the mobility services & automated driving technology. The automotive electronics industry is highly competitive due to the presence of several strong and leading automobile system manufacturers across the globe with their extensive distribution network. Moreover, the need to address the OEM demand and provide timely & accurate product delivery has resulted in developing several manufacturing facilities across the globe. The companies have developed strong supplier and customer relationships to maintain a competitive market position. Manufacturers are focusing highly on R&D capabilities that aid in contributing advanced offerings depending on the OEM and end customer requirements.